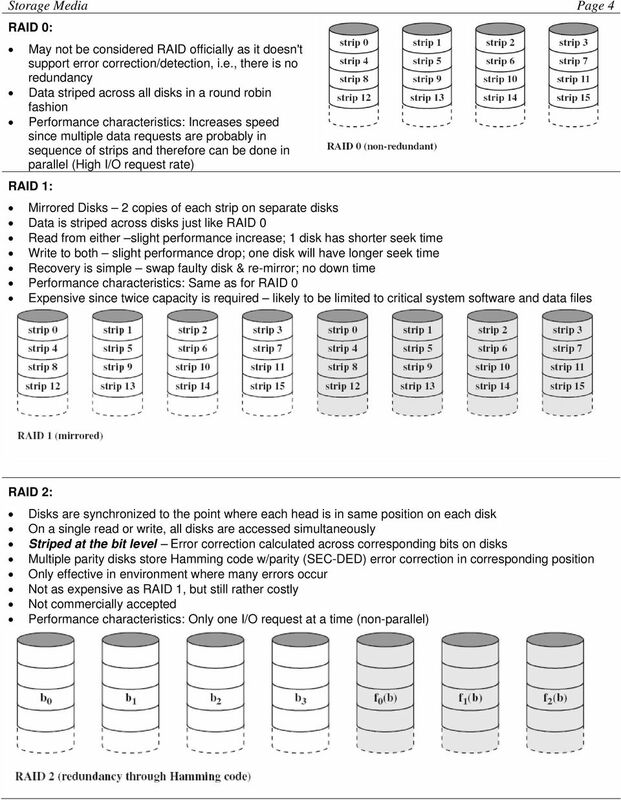 Download "HARD DRIVE CHARACTERISTICS REFRESHER"
2 Storage Media Page 2 SIDE-BY-SIDE COMPARISON OF ENCODING METHODS LATEST ENCODING TECHNOLOGIES Improved encoding methods have been introduced since the development of RLL Use digital signal processing and other methods to realize better data densities. 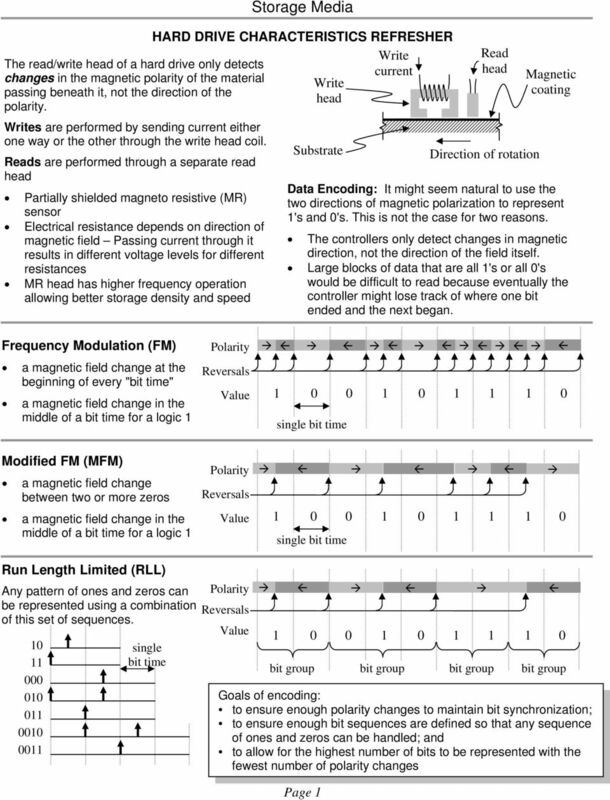 These methods include Partial Response, Maximum Likelihood (PRML) and Extended PRML (EPRML) encoding. 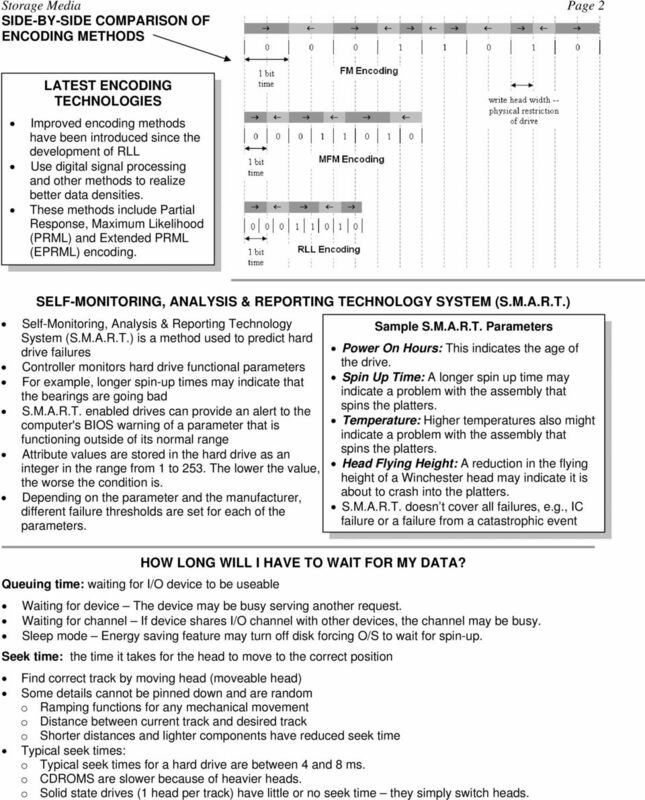 SELF-MONITORING, ANALYSIS & REPORTING TECHNOLOGY SYSTEM (S.M.A.R.T.) 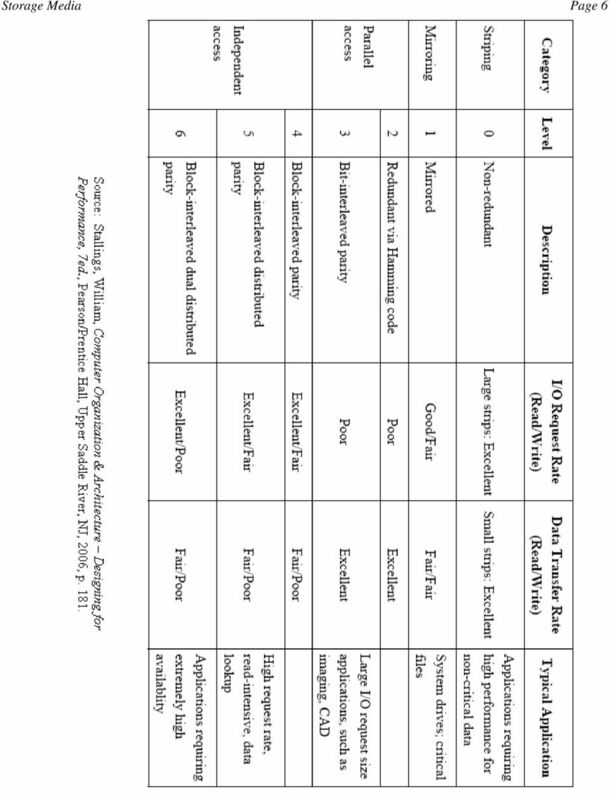 Self-Monitoring, Analysis & Reporting Technology System (S.M.A.R.T.) is a method used to predict hard drive failures Controller monitors hard drive functional parameters For example, longer spin-up times may indicate that the bearings are going bad S.M.A.R.T. enabled drives can provide an alert to the computer's BIOS warning of a parameter that is functioning outside of its normal range Attribute values are stored in the hard drive as an integer in the range from 1 to 253. The lower the value, the worse the condition is. Depending on the parameter and the manufacturer, different failure thresholds are set for each of the parameters. Sample S.M.A.R.T. Parameters Power On Hours: This indicates the age of the drive. Spin Up Time: A longer spin up time may indicate a problem with the assembly that spins the platters. Temperature: Higher temperatures also might indicate a problem with the assembly that spins the platters. Head Flying Height: A reduction in the flying height of a Winchester head may indicate it is about to crash into the platters. S.M.A.R.T. doesn t cover all failures, e.g., IC failure or a failure from a catastrophic event HOW LONG WILL I HAVE TO WAIT FOR MY DATA? Queuing time: waiting for I/O device to be useable Waiting for device The device may be busy serving another request. Waiting for channel If device shares I/O channel with other devices, the channel may be busy. Sleep mode Energy saving feature may turn off disk forcing O/S to wait for spin-up. 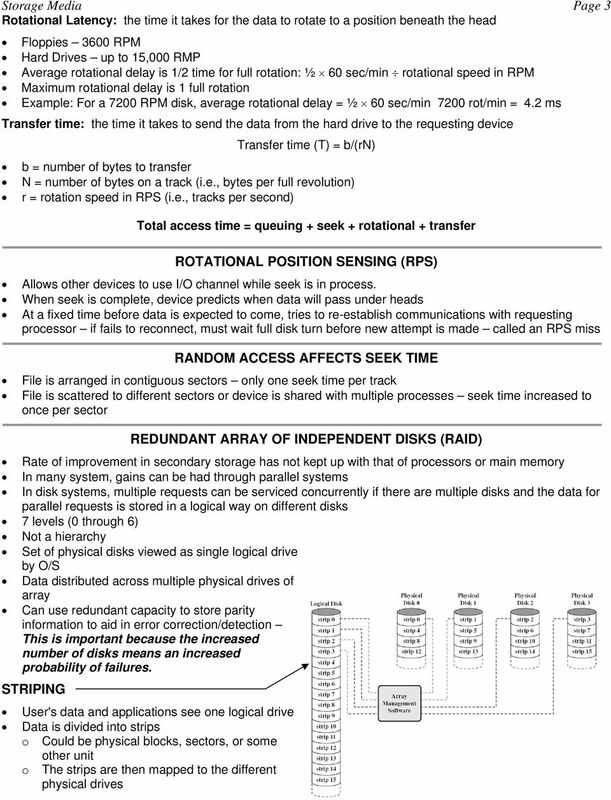 Seek time: the time it takes for the head to move to the correct position Find correct track by moving head (moveable head) Some details cannot be pinned down and are random o Ramping functions for any mechanical movement o Distance between current track and desired track o Shorter distances and lighter components have reduced seek time Typical seek times: o Typical seek times for a hard drive are between 4 and 8 ms. o CDROMS are slower because of heavier heads. o Solid state drives (1 head per track) have little or no seek time they simply switch heads. 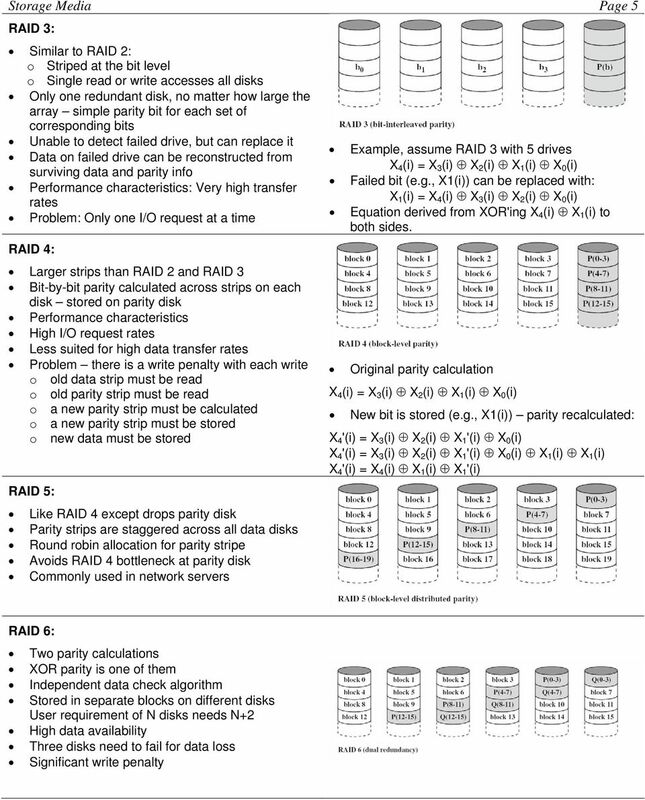 Assessing the Reliability of RAID Systems By Abraham Long, Jr. To determine the overall reliability of a RAID-based storage system, it is important to accurately assess the reliability of the RAID subsystem.